This is my FAVORITE and I mean favorite time of the year. I love all the happiness, decorations, and of course the baking. I mean who doesn't love walking into a house that smells like freshly baked cookies? My daughters love it! Baking from scratch can be a pain, especially if you don't have everything you need but thanks to Betty Crocker, I'm always prepared to make a fresh batch of White Chocolate Dipped Sugar Cookies. Baking is something I always do during the Holidays. My daughters love to help me in the kitchen, which is great for family time. One of our favorite recipes are my White Chocolate Dipped Sugar Cookies. 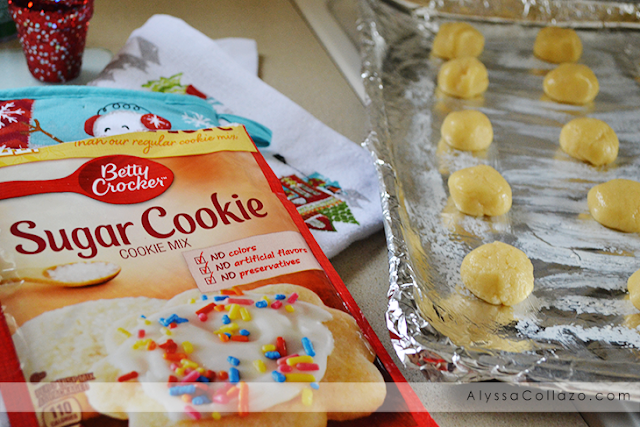 Using Betty Crocker's Sugar Cookie pouch made this recipe so easy to make and mess free, I really can't ask for more. 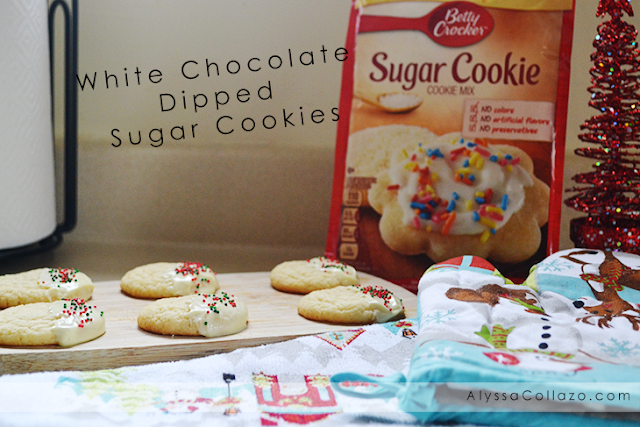 For this recipe you will need a pouch of Betty Crocker's Sugar Cookie, which you can find at Walmart aka my favorite store EVER! Everyday low prices, plus an amazing baking section.. You just can't beat that! Let's get started. Prepare your Sugar Cookies according to the package. This time around we followed the drop cookies recipe. Once the cookies are cooling off, grab your sprinkles, I used red and green for some Christmas spirit and put them in a bowl. Next, melt your White Chocolate. I used an easy, microwaveable bark, which you can find at Walmart. 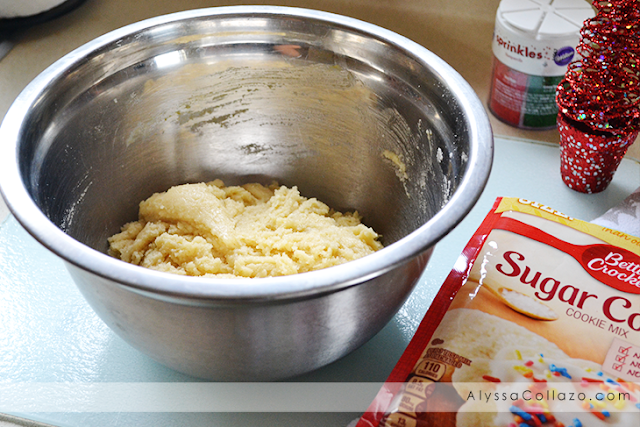 Set your station up and get ready to dip and sprinkle your sugar cookies. Dip a cookie in the white chocolate and sprinkle on some sprinkles. Let it cool on wax paper or a plate. Once your done with all your cookies, place them in the fridge for about 5 minutes or until your chocolate is set. These cookies turned out great. My family absolutely loved them and I loved how easy it was thanks to Betty Crocker. 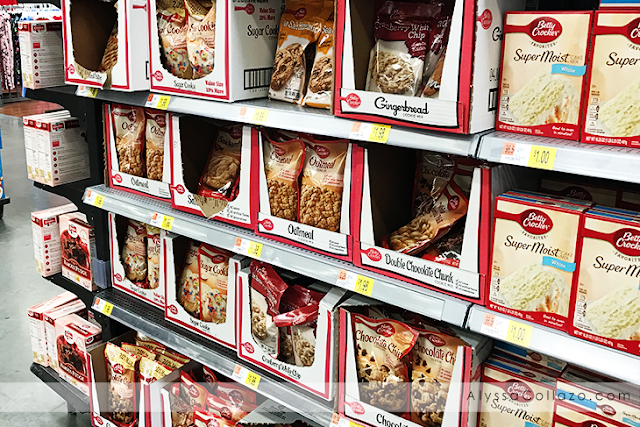 Be sure to pick up some Cookie Pouches at your local Walmart to have on hand during the Holidays. What is your favorite Holiday Cookie Recipe? I'm drooling! These look amazing. My husband is going to die when I make these... he is obsessed with sugar cookies! 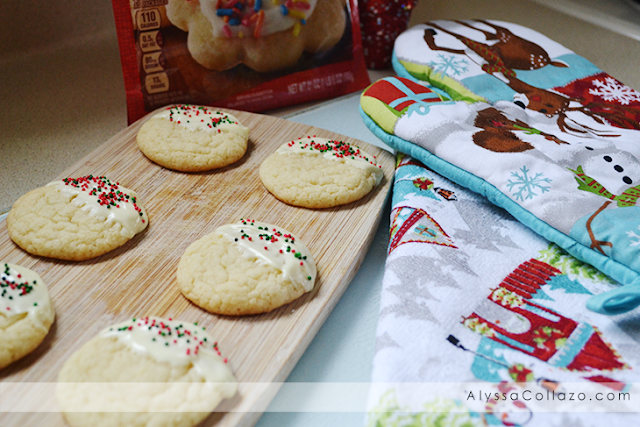 Sugar cookies are a staple and there are plenty of ways to serve them! I really like this idea of yours! The white chocolate will compliment the taste of the cookies! I really love baking.. Sweets is life.. Lol.. I will try this recipes looks delicious.. Great idea for giveaways..
Well I love white choc and I do love cookies as well so this seems like the perfect combination and the best of both worlds. Yum. I think this is such a great idea. I am going to make some for our neighbors. oh that sounds soooo good! I dont like sugar cookies but these look good! YUM! We love sugar cookies!! These sound amazing I have never dipped cookies before going to ahve to try this out this winter! I haven't tried their sugar cookies yet but this looks amazing. I'm so going to try make them this weekend since my son has his friend coming over for play date. I know they're going to love it. These look so delicious and beautiful! I love how simple they are, but would look so beautiful on the holiday table! I am really craving a sugar cookie now. I will have to pick up a Betty Crocker mix or TWO when I am at the store today. I love making sugar cookies but I am not somewhat available to eat this for some health reasons. My husband and sons love eating SUGAR cookies; however, I have a great idea to decorate some Christmas tress cookies. Thank you for sharing! I love sugar cookies but I never thought to dip them in white chocolate before. These look heavenly! hmmm these cookies look inviting :) I suppose they are easy to prepare too. What a fun way to jazz up sugar cookies! They look super festive! Betty crocker do make it easier for us to bake. I love these cute cookies!